I’m back in Toronto and I’m telling my Dad about the wildness and beauty of British Columbia. Sure I have photos to show and blog posts to write but videos are what he appreciates most. So I’m thumbing through YouTube and stumble upon this video. It’s my introduction to Canadian spoken word poet Shane Koyszan. This is not his most famous work. That would be “To This Day” about bullying, shown here in a TED talk . For me though, this video is my favorite. The words and images reflect my awe and wonder of the wild Pacific Rim in beautiful, wonderful, super natural British Columbia. Surrounded by the natural wonders of BC’s rain forests and wild life, it is easy to appreciate the myths and legends of the First Nations people. 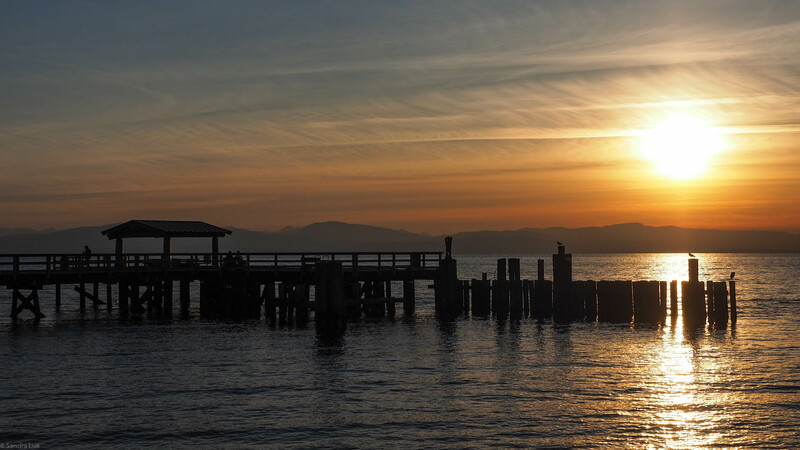 The original inhabitants of the Pacific Northwest relied on oral tradition to record their history and carved totem poles to create a permanent record of events. Typically the totems were carved from the single trunk of a cedar tree. Totem artists often speak of a spiritual connection to the original tree. “When a great tree is chosen for a totem pole or a canoe, there are ceremonies to celebrate the rebirth of the tree into a new existence. These ceremonies reflect our understanding that there is a spiritual connection between man and tree, that we are all aspects of a greater whole, and that the apparent differences between flesh and wood are insignificant compared to the kinship between the spirit of the tree and the spirit of the carver.” (Richard Krentz, Salish artist. Nov 2012). 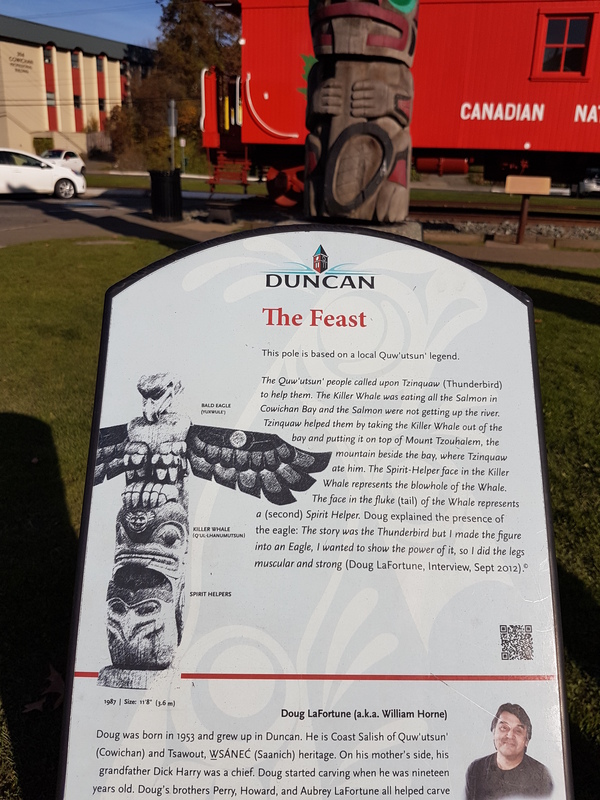 The city of Duncan aka “City of Totems”, has one of the world’s largest, outdoor collection of publicly displayed totem poles. 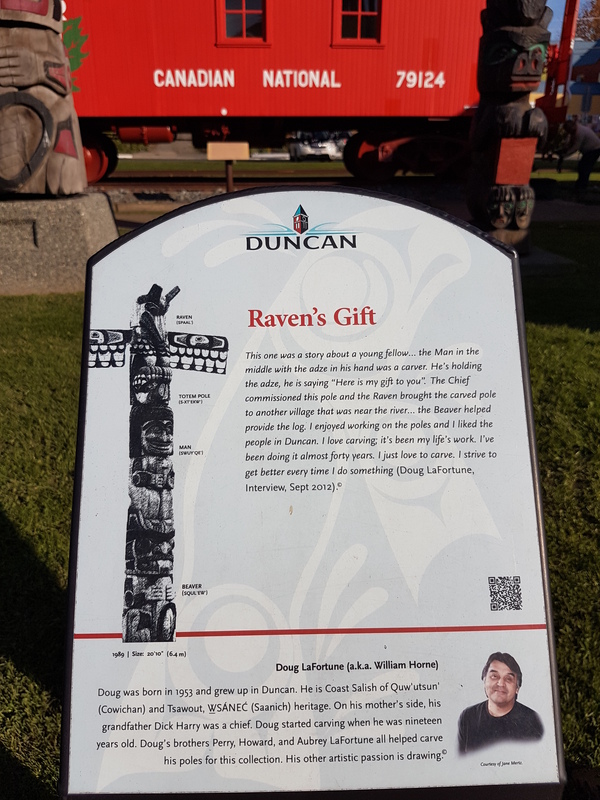 They were created in a joint community project with the Quw’utsun’ (Cowichan) people. Altogether some forty totems are placed around the city, on land acknowledged as traditional Quw’utsun’ lands. In another city Sooke, is an artfully painted fiberglass bear “Kody”. Kody was part of a public art initiative and was created by local Sooke artists Gene Sebelius and Bonnie Spencer. He captures the Kitasoo legend where Raven, who created all living things after the great ice age, went among the bears and turned every tenth bear white as a reminder of the time when the world was pure and clean and covered with ice. As a point of fact, the Spirit bear does actually exist. In modern science he is called the Kermode bear and lives only in British Columbia’s Great Bear Rainforest. He is not related to the polar bear nor is he an albino. He is a Black Bear with a recessive gene that causes about 1 in 10 bears to be white. Families of these bears can consist of both black and white bears. A wonderful meet up of myth and science, history and life, coming together in art. The best way to experience nature is to take a walk. 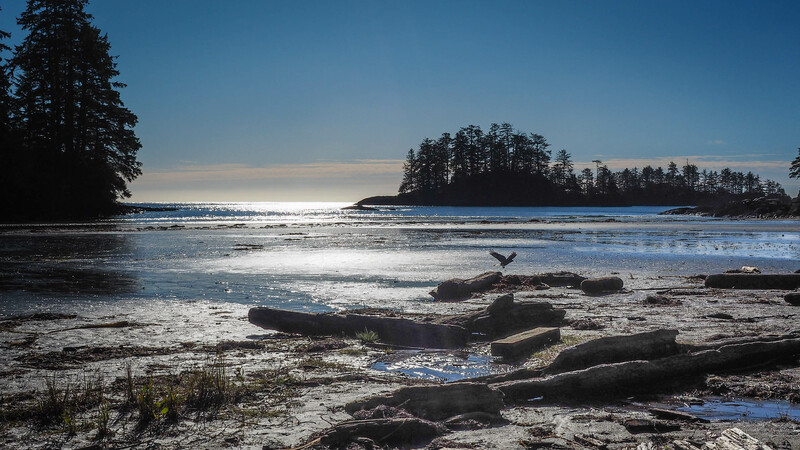 While exploring Tofino we took a hike to Schooner Cove in the Pacific Rim National Park. 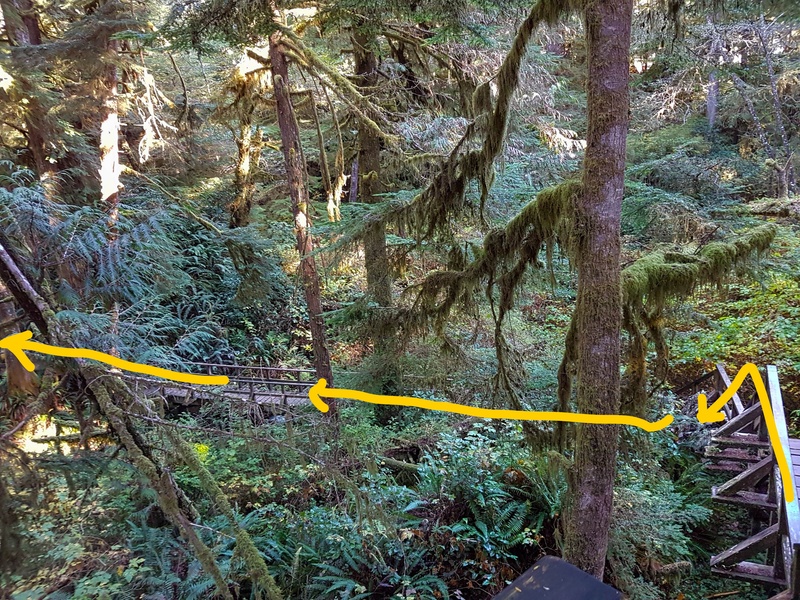 The web page said it was a short and relatively easy trail, leading through lush rainforests and over gentle meandering streams. “How long is it?” I asked. “It’s not far,” hubby said. “Less than ..” he mumbled into his shoulder as he turned away to get something from somewhere else. So we walked. It started out easy enough. But after walking down and around for what seemed like forever, we came to this extended ramp. At this point, with only the faint promise of surf in the distance, we had too much vested in the walk to turn back. We continued walking, going up and down several more ramps and valleys until we faced the final ascent. On paper it is only a two kilometre hike. However most of it is climbing up or down stairs. It could have been worse. If there wasn’t a board walk for instance. But then I probably wouldn’t be taking this hike. How was Schooner’s Cove, the final destination? It was good. After the walk we went back to the hotel. 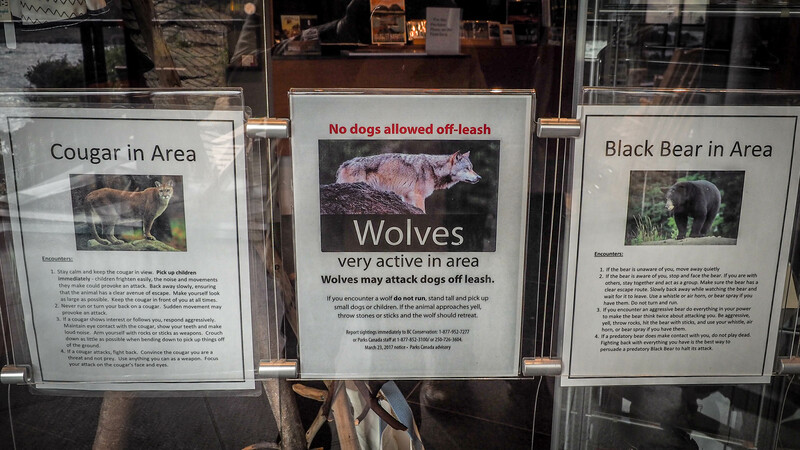 Thoughtfully displayed, for our post-walk reflection were these warning signs. Cougars, Wolves and Bears. Oh dear. If I could do complex line drawings, this is what a blustery winter walk by Oak Bay beach would look like. Digital photo editing is so cool. It panders to my delusions of talent. According to Maps it’s a four hour, high-way drive from Vancouver to Summerland in the Okanagan valley. Ample time we thought, to take the morning ferry, disembark at noon, drive and arrive before dinner. That might have worked, except that .. It was mountain range driving. It had snowed the previous two days. After leaving Hope, the BC-1 exit signboard warned of fog and ice on the mountain pass. Extreme caution and tire chains were required. I didn’t recall seeing a snow brush in our rental car. I didn’t think there were tire chains hidden in the trunk. I was the trip navigator (Google Maps reader) and with hubby’s assent, we doubled back to Hope and took the slightly longer (30 minutes) but more southerly BC-3 route to Summerland. After three hours of driving, Maps said that we still had another 259 kilometers and three hours left to go. I spent my time looking at the mountain views, peering for deer and big horn sheep. By 3pm darkness was falling like a blanket over the winding and steeply descending road. We had forgotten that Daylight Savings Time had pushed the clock back one hour. By 4pm the Maps screen had gone black for the night. It said we still had three hours left to go. Eventually we reached our hotel in Summerland, nearly six hours after leaving Vancouver. It was pitch black over the lake and distant city lights barely flickered through our room’s window. But here is what I saw the next morning. After breakfast we wandered in to the city’s Information Center. “What can we do today?” I asked. 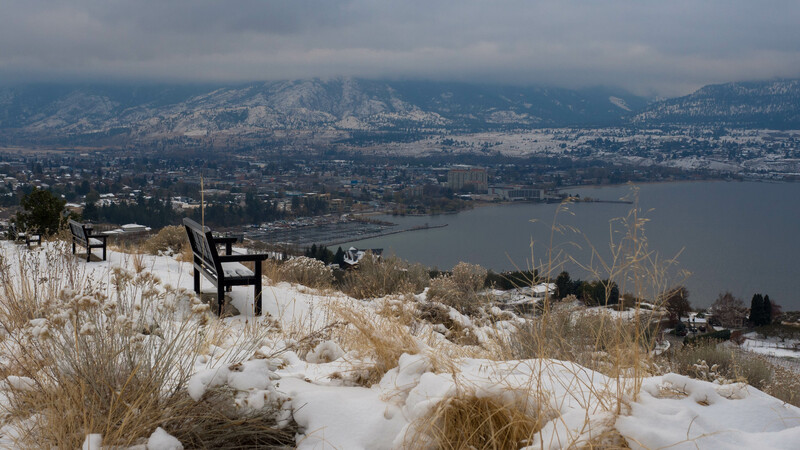 Stretched out below is Penticton, Summerland and Lake Okanagan. 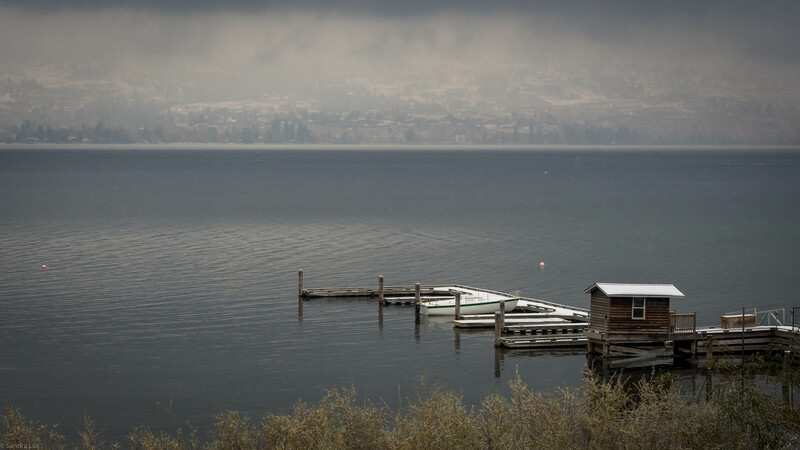 On a clear day, we could probably see Skaha Lake. Maybe even Kelowna. It would have to be a very clear day in summer. We’ll have to come back then and see. I apologize for taking so many pictures of sunsets. I apologize for calling them fabulous! gorgeous! stupendous! I apologize for doing the hysterical equivalent of SHOUTING in caps. I just cannot help myself. When faced with the spectacular splendor of a setting sun, I am overcome with sappy alliteration and I take pictures. I take hundreds of pictures. More pictures than I can use. More pictures than I dare to share. Forgive me as I share one more. After years of living in China and South East Asia it was time to come home. But after a few weeks in Toronto, hubby and I realized we still had the whole of Canada to explore. 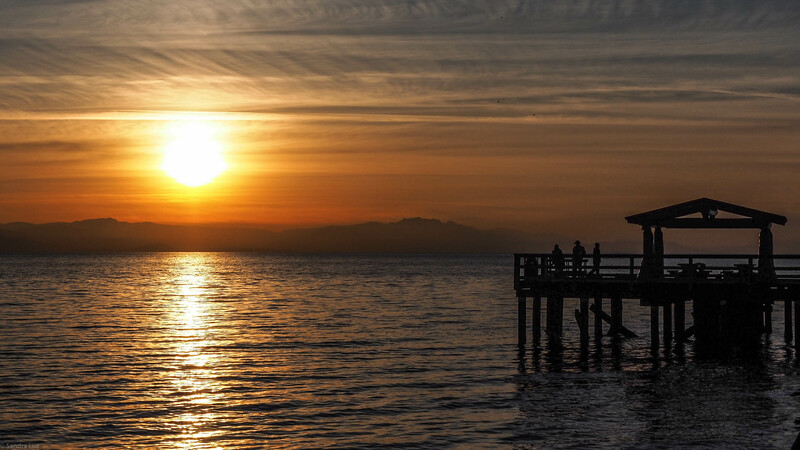 Starting with Vancouver Island in beautiful British Columbia. The island is off the Pacific coast line of Canada and USA. It has an unprotected face to the Pacific and is characterized by extreme weather, rugged coastlines and awe inspiring views of mountains, sea and sky. These pictures were taken at Long Beach in Tofino. It was an unusually warm (12 degrees!) and sunny day in November. Normal weather is cold with constant rain and intermittent periods of more rain. With a dour scowl a local resident told me that “last year it rained every day for four months.” This summer though was a good one. It was a dry and sunny. Lucky for me, a bit of summer hung around. There are two types of people in Tofino. Those who walk and those who surf. I fall in the category of walkers. One day I might even get a dog.